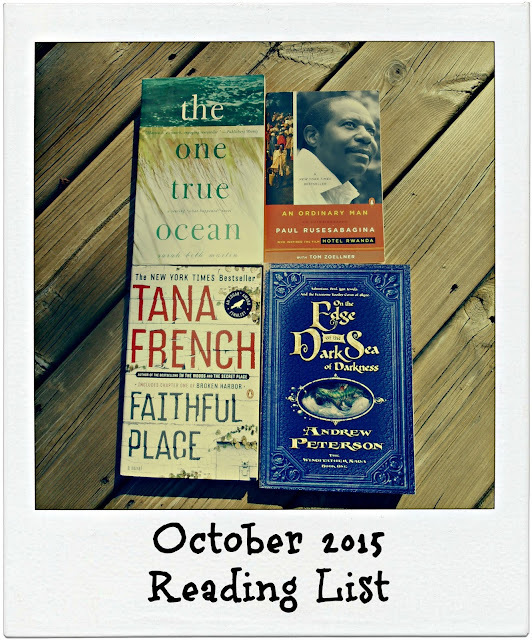 Well, here's hoping October is a better reading month than September! Not that I've had a lot of time to be reading lately- between school, craziness at work, and just life. I still have two books I started last month that I'm hoping to finish this month, and now here are four more that I'm adding to the mix. The One True Ocean by Sarah Beth Martin- This one caught my attention because it's a mystery, and takes place in Maine. It's one of those stories where the main character is drawn back home for some reason or another and decides it's time to solve some mystery of their families past. It sounds like it's in the same vein as Drowning Ruth. An Ordinary Man by Paul Ruseabagina with Tom Zoellner- This is an autobiography of the man Hotel Rwanda is based on. Since I love the movie, I snapped this one up when I found it at a thrift shop. On the Edge of the Dark Sea of Darkness by Andrew Peterson- This book came from Just Bee when I won a giveaway she was hosting. She and her husband love this series and it looks like it'll be an interesting read. It's book one in the series Wingfeather series. Faithful Place by Tana French- I know I've only said it about a hundred times, but I LOVE Tana French. I was super excited when this one came in the mail from A Book Olive and I can't wait to read it. So that's what I'm hoping to read this month. What are you planning on reading? Always love finding other Tana French lovers! I'll have to check out Louise Penny and Elly Griffiths.